I’m not going to bother with any long intro to this dish, all I will say is that I made it tonight, probably enough to serve 4 people and we polished off the lot. We seriously COULD NOT STOP. You will have heard a million times, Thai food is all about the balance – sour, sweet, salty. You’ve got to get that right in this dressing but honestly, it’s not brain surgery. This dish is a kind of hybrid salad! 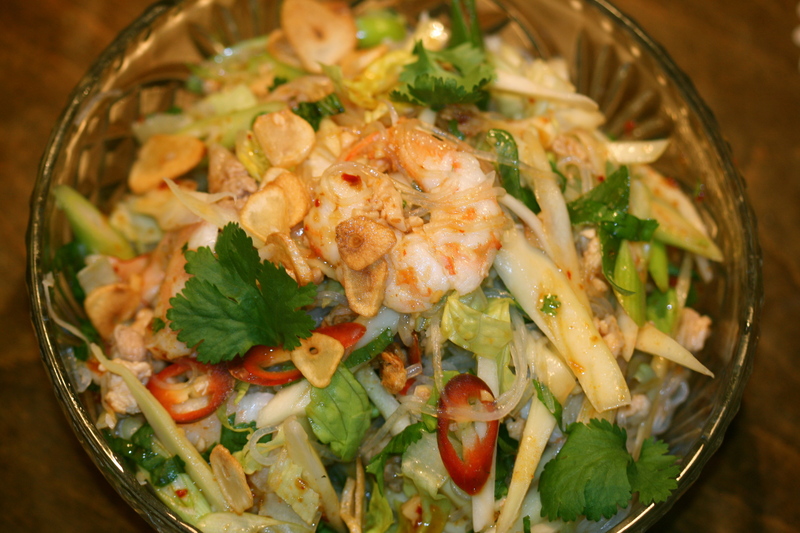 Paul always makes this beautiful glass noodle salad with shredded cos lettuce, herbs and prawns and I love to make Thai green mango salad when the fruit is in season. I yelped with excitement the other day at our Asian green grocers when I saw them there for the first time since last summer! Beautiful, slender, sour green mangoes. And thirdly, everyone’s favourite Thai salad – Larb – the one with the roasted rice powder and ground meat.The result is a bit of all these and boy was it amazing! Like any salad you have full artistic license with this one – you just have to remember the sweet, sour, salty balance thing. The star ingredient of ‘larb’ – the roasted rice powder, is not in this salad, I made little fried garlic slivers instead. 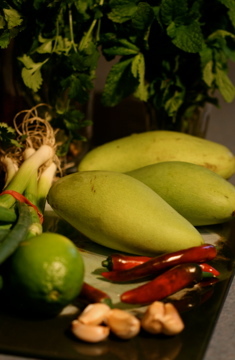 2 Thai green mangoes (you want them very firm and green so they are tart and crunchy, not soft and floppy) See picture below! A rule of thumb for this dressing is to use equal quantities of sour, salty, sweet – but you can make it to suit your taste. Just start with less and adjust gradually as you know fish sauce is mega salty! Now that you’ve scrapped the idea of making this salad because the list of ingredients is soooo long, WAIT! You can make this without the three different meats and just pick one – or use none and serve it alongside grilled fish or meat. We bought prawns and then realised we had a leftover pork chop and some chicken breast so we used it all up. If you don’t have the chilli bean paste the dressing is beautiful without it. Combine dressing ingredients in a bowl and mix well to allow sugar to fully dissolve. Set aside. Soak your noodles in hot water according to packet directions, drain, cut into manageable lengths and set aside. Slice the garlic and shallow fry it in a little oil until they just start to change colour – these will burn easily and remember they will continue to cook and darken in colour even once they have been removed from the hot oil. Drain on paper towel. Slice the spring onions and chillies on the diagonal into thin slices. Shred the cos lettuce (not too fine). Peel the mangoes. Cut into thin strips** see below for notes on this**. Place all the above ingredients in a large salad bowl. Slice the prawns in half – add to the salad. In a very hot pan with a little oil, fry minced pork and chicken with the 1 tbsp fish and the sugar until it is lightly coloured. Allow to cool slightly. Add to salad. Roughly chop herbs (if you wanted to add thai basil or vietnamese mint you can) and add to the salad. Toss all salad ingredients with the dressing until well mixed. Sprinkle with a handful of smashed roasted peanuts and some of the little fried shallots to serve. ** You can cut the mangoes any way you like really but I do rough julienne strips the way a Thai friend of mine taught me to and it’s quite nifty and looks nice- you hold the mango so that it’s lengthways down the palm of your hand (i.e. where the stem would be is at the top of your middle finger), with a sharp pairing knife or short bladed knife cut incisions in the mango from top to bottom (they don’t have to o all the way through to the seed), then turn your knife so that the blade is perpendicular to the incisions you’ve just made and scrape off the strips. Confusing? Just slice off thin slices from each cheek and then slice into thin strips. Firm, bright green mangoes are what you want. Most Asian green grocers should have them through Spring and Summer. You can skip the chillies if you don't like spicy. Cannot wait to make this. Yum! I really like this salad Claire and have sent it on to Patty and Paige (who loved it). Also I’m sending the blog details to my cousin Lou in America – I think the foodies there will enjoy keeping up with your recipes. It’s nearly a year since we all had that crowded dinner together. Hey thanks! You know it would be nice to get some more traffic – I’ll think I’ll follow your lead and email it to some people. I got a message from Paige this morning saying that the green mango hunt had begun in NYC! Doesn’t time fly – was that really a year ago? Feels like months ago. Yikes! You go to a lot of trouble with your blog site and the result is so good it would be nice for more people to be in that particular loop. I like the fact that it sends an email when something new has happened. I’ll let more of my friends know about it and even if they never contact you we’ll know it is giving them pleasure.